My Lady and I have often visited the Victorian high country and a few weeks back we talked about activating another of the SOTA summits in the vicinity of Falls Creek. Back in December we activated Mt McKay and had thought about going on down the road from there and activating Mt Cope, but in the end we ran out of time on that trip, so we decided that we’d make Mt Cope the destination for our next expedition up that way. Checking the SOTA Watch alerts I noted that Greg, VK8GM, was intending to activate Mt Gillen, a Summit in the MacDonnell Ranges to the west of Alice Springs, on the morning of Sunday 23rd March. 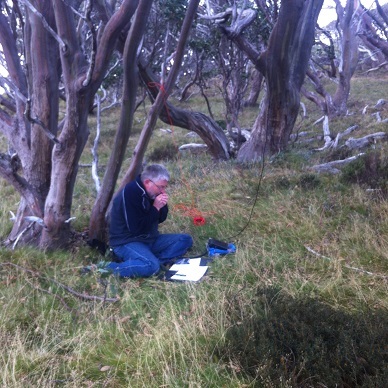 As this was to be one of the very first SOTA activations from the Northern Territory we decided we’d time our Mt Cope trip to coincide with Greg’s activation in the hope that we could make a Summit-to-Summit contact with him. 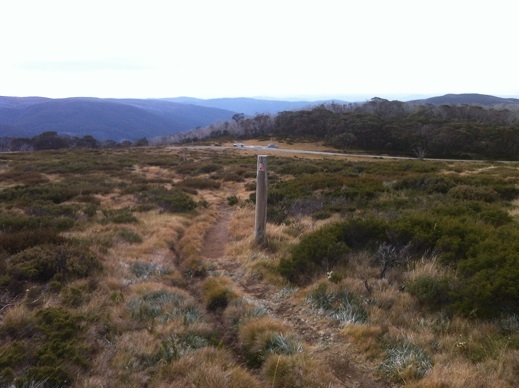 It’s a tad over two hours to drive from Albury to Falls Creek and a few minutes more to reach the car park at the start of the Mt Cope walking trail, so we got up early and hit the road in plenty of time to arrive at the Summit on schedule at 10am local, 2300 UTC. I scoured the web for information on cycling events, since roads in the high country are often brought almost to a standstill by hordes of outrageously fit bikers huffing and puffing their way up the impossibly steep slopes, weaving and wobbling all over the road while columns of hapless motorists crawl along behind, hoping vainly for an opportunity to edge past the wall of lycra-clad backsides. CYCLISTS SHARE THE ROAD says the sign. Yeah, right. A Famous Search Engine failed to find any mention of an organised cycling event on Sunday 23rd, so I figured our chances of getting through unhampered were probably good. Didn’t mean there would be no cyclists on the road, not by any means, but there should only be the occasional small group out for a Sunday ride and not the thousands that turn out for the big rides. So it proved, and although we did pass several cyclists working their way up from Bogong Village to Falls Creek they were well spread out and weren’t causing a major traffic hazard. It was a beautiful morning as we set out, following the Kiewa Valley towards Mount Beauty. There were still patches of mist lingering close to the river, but the sky was clear and it promised to be a fine day. We reached the car park with plenty of time to spare, though by that time a high-level overcast had begun to obscure the sun and a chilly breeze was blowing from the west. We were glad of the warm jackets that we’d brought along in anticipation of something like this. 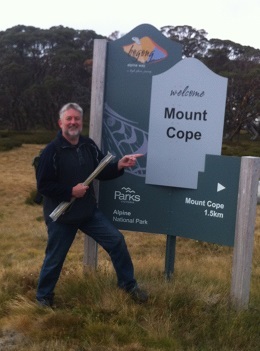 It’s a 1.5km walk from the car park to the summit of Mt Cope, according to the sign. We took our time strolling up there, checking out the views in all directions as we went. The breeze freshened and we decided it would be a good idea to find some shelter behind a boulder, or anything that would get us out of the wind. Operating from the actual summit, which is very exposed and has no shelter at all, was not going to be an option. In the end we selected a spot a little below the summit, among a stand of snow gums that afforded a little protection and acted as a wind break. They also provided a convenient branch to sling the link dipole, so the pole we’d carried up with us wasn’t required. We were a little early getting on the air, so I checked the SOTA Watch spots to see if VK8GN had appeared. He hadn’t, so I spotted myself and then proceeded to make a string of contacts on 7MHz SSB over 20 minutes or so. These were VK5PAS, VK3DET, VK2GAZ, VK1DR, VK3PF/p (S2S), VK5WG, VK1EM, VK1NAM, VK1DI, VK2CCJ, VK2CCW, VK3YN, VK2IO, VK5LY, VK3CAT, VK2YW, VK3XL and VK2DAG/p. By this time SOTA Watch told me that VK8GN had appeared on 14MHz so I quickly popped out the dipole links – the wrong ones as I later discovered – and went up to join the pile-up. It turned out that Greg VK8GN had been joined by Kaz VK8ZAZ for the activation and they were working their way through a very respectable list of callers. I wondered how my FT817 with its 5 Watts would fare, but I needn’t have worried. Greg heard me on my second or third call and I exchanged good signal reports with him, closely followed by Kaz. 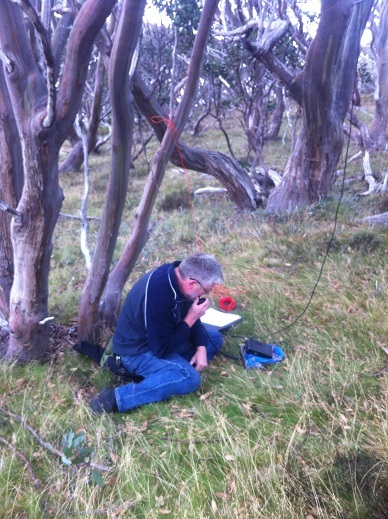 I was delighted to make these two contacts, and get my first VK8 SOTA summit in the log. Excitement over, I was thinking of dropping back to 7MHz or perhaps 10MHz to see if I could catch Warren, VK3BYD, who I knew was out there somewhere doing a CW-only activation. My Lady pointed out that not only was she freezing but I was too. My fingers were so cold that I couldn’t operate the keyer properly, so rather than subject poor Warren to my mangled Morse we decided to pack up and head back to the car. We could always find a convenient spot later on to throw the dipole back up and chase Warren, and anybody else who happened to be about. When I went to drop the dipole I first put the links back in, and discovered that in my eagerness to contact the VK8s I had inadvertently popped out the 18MHz links instead of the 14MHz ones. The FT817 hadn’t complained about the mismatch and Greg and Kaz had evidently heard me all right, so I guess it wasn’t too critical. Maybe I’d better label the links though, to stop this kind of thing happening in future. Currently they aren’t labelled; I just count from the end of the antenna, which is fine as long as my brain is focused on the task and not distracted by the cold and/or the chatter on the radio. We warmed up a bit on the walk back to the car park, but the hot cup of tea that awaited us there was very welcome. In the event we didn’t get back on the air again that day, instead spending time exploring around Falls Creek and down towards the Pretty Valley camping areas. We had lunch at the Pretty Valley hut, imagining what it might be like in winter with snow all around. We might have to go back up in a couple of months or so to check that out.